If you’ve been paying attention to the Center for Rural Affairs’ work with Native American communities, you know a grassroots movement for food sovereignty is underway. Garden workshops in Macy and Santee are facilitating a garden revival via farmers markets. Programs at the Nebraska Indian Community College campuses introduce students to growing food. And innovative efforts like the Unci Maka (Grandmother Earth) Public Market are putting tribal food traditions back on the table. However, unreliable water access is often a roadblock for gardeners in both communities. So in early September, we organized two rain barrel workshops in Macy and Santee. Participants went home with a new (ancient) tool in their food sovereignty tool box; ready to collect and store their own water direct from the sky. Organizers Dave Farley and Veronica Erenberg coordinated the effort among existing garden groups. We brought in Ellen Wright, a watershed and water quality educator from Lincoln, to get us started on the right foot. The practical hands-on workshops occurred over two days, covering the principles of rainwater catchment and storm water management. It also detailed construction and installation of the barrels. In all, we prepared 30 barrels for distribution this season. At our workshops, 12 people went home with rain barrels ready to be installed on their downspouts. 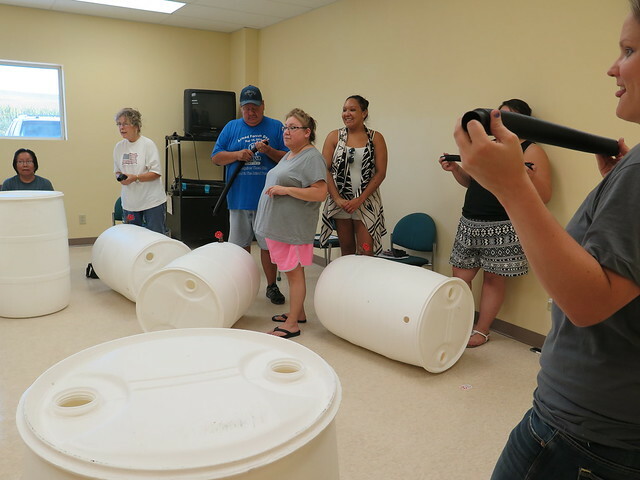 Both campuses of the Nebraska Indian Community College received barrels for their garden activities.